After an awkward exit at Clemson, Kelly Bryant arrived at Missouri just before the NCAA brought down the hammer, but his first few months in Columbia have confirmed his decision to be a new kind of Tiger. COLUMBIA, Mo. — When Kelly Bryant received a text message about an unplanned team meeting on the morning of Jan. 31, the quarterback was caught off-guard. He and his new Missouri teammates had just finished a workout, but this was the dead of the offseason, a period he expected to use to settle into his master’s program and wade through the Tigers’ playbook. He’d been on campus in Columbia less than a month. Bryant assumed someone had been fired—weird timing, but that explanation made at least a little sense. And so he filed in with the rest of his team and learned from head coach Barry Odom that Missouri had been hit with a one-year postseason ban, as well as recruiting restrictions, after it self-reported that a tutor had completed coursework for six athletes, including one football player for whom she took a class in its entirety. No one in Columbia had expected even half as harsh a punishment. Bryant was shocked. The former Clemson quarterback had lost his starting job to freshman phenom Trevor Lawrence, who lifted the Tigers to a national championship after Bryant led them through a 4–0 start. Bryant conserved his final year of eligibility by taking advantage of the new redshirt rule and leaving the team before he could play his fifth game, and then he hit the transfer portal, seriously considering five schools: Auburn, Arkansas, Mississippi State, North Carolina and Missouri. When he chose his new Tigers, fans at his other potential landing spots—particularly Auburn and Arkansas—turned to social media, as the aggrieved college football fan does, to call the quarterback a fool, claim their teams didn’t even need him or warn him that he was making a massive mistake. He ignored them, a skill he had honed to perfection over the previous few months. But these NCAA penalties? If Twitter was an ambient buzz he could learn to live with, the sanctions were a siren. There was no ignoring the fact that Missouri was forbidden from playing in a bowl game in 2019, much less contending for the College Football Playoff. But as Bryant took in the news, he also took in his teammates. And so does Bryant. 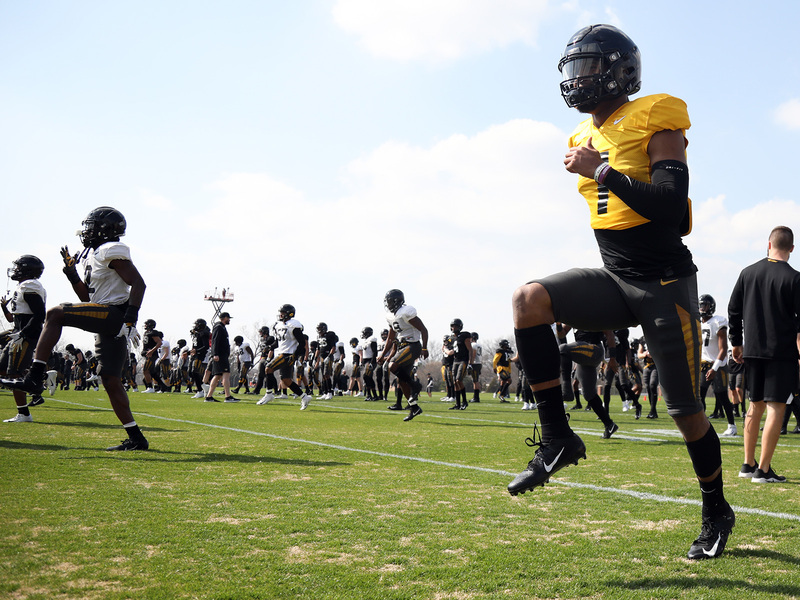 As Missouri waits for its NCAA appeal—which it filed on March 25, several weeks after purchasing billboards in Kansas City and St. Louis that read “MAKE IT RIGHT”—spring ball has gone as usual for a team looking to build on 2018’s 8–5 finish. These weeks of practice have been Bryant’s first opportunity to win over his teammates on the field and acclimate himself to offensive coordinator Derek Dooley’s expansive playbook. There are new signals to learn after four years in the same system, new receivers’ peccadillos to sort out and internalize. The adjustment goes both ways, though. Missouri’s offense is figuring out how to maximize the skills of a more mobile quarterback. Bryant stands an inch shorter than the signal-caller he replaces, 6'4" future first-round pick Drew Lock, who has a cannon for an arm and threw for 3,498 yards last season. Rountree, who grew up in Raleigh, is another one of Missouri’s four players from the Carolinas. He loves to gig Bryant about the Shrine Bowl of the Carolinas, a high school all-star game that South Carolina hasn’t won since Bryant was a senior four-star at Wren High School in Piedmont, S.C. Bryant’s westernmost college offer came from Ole Miss, and he had never set foot in the state of Missouri until he visited Mizzou last fall. His 12-hour drive to campus this winter was one of the longest of his life, and he still seems surprised to find himself here, in a town where spring didn’t arrive until April, playing for a program without a title. As Missouri thawed out of its coldest snap in decades in late January and the rest of his team shrugged off the impending sanctions and refused to jump ship, Bryant decided to stay, too. Had he remained at Clemson, he would have his second ring and enter this fall with a chance at a third—but he would have been a backup with a difficult road to a future in football. For the first time in his career, barring a successful and speedy appeal by Missouri, he’ll begin a season with no shot at the playoff, but there’s no time for thoughts like those. He has a chance to impress NFL scouts by putting together a strong season in the country's toughest conference. He’s Missouri's guy, and this spring, he looks the part. Bryant has begun to open up to his teammates about his years at Clemson, about reaching the playoff and playing in the ACC. Recently, he drew laughs as he told the story of the 2017 game against NC State when Wolfpack defensive lineman Bradley Chubb stole the towel from his hip three different times. He has talked about what it’s like to compete in the playoff and to win it all as he did as Deshaun Watson’s backup in 2016, but those conversations are more about imparting experience than dishing out advice. Bryant doesn’t view himself as some sort of savior for a team with no solid plan at quarterback after Lock. He also knows better than anyone that job security is fleeting.